Diving with PDC always starts with a lovely one-hour boat ride to reach Coiba National Park. Most people hope for dolphins on the surface since they bring an unexpected joy to the boat ride. 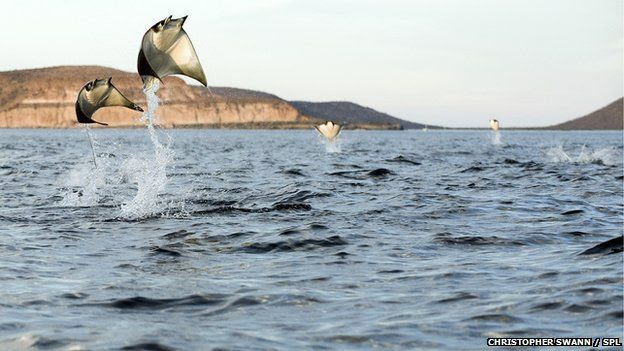 But the amount of plankton in the water makes it more common to see another beautiful creature jump out of the water: the Mobula ray (also known as devil ray). They can jump up to six feet, twist, turn and either land flat on their belly or go in smooth as they came out of the water. Scientists are not sure why these rays perform incredible surface acrobatics, but research suggests that these high jumps are related to their way of communicating, courtship rituals, escaping from predators and the removal of parasites. 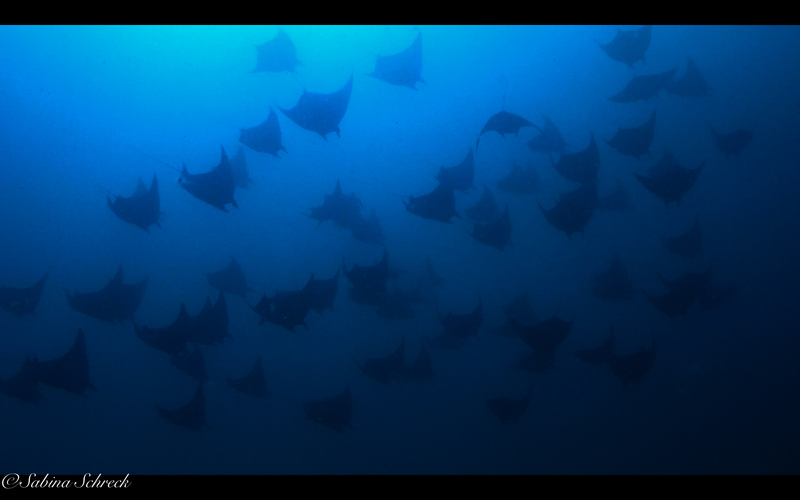 When diving in Coiba it’s quite common to see these beautiful Mobulas almost fly through the ocean. These great swimmers and jumpers move their fins up and down to steer through the water. Sometimes you see one or a couple performing a little show but if you’re really lucky you can see big schools of 100+ Mobulas passing by while you’re diving or during your safety-stop. Especially while feeding, eating plankton and tiny fish, Mobulas group together. It’s incredible how they can create a dark cloud of movement in the ocean. 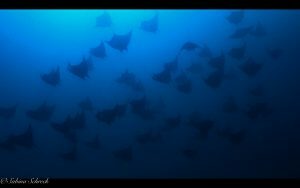 It’s very rare to see these big schools of Mobulas passing by while diving, so we’re very lucky to have them as regular visitors in Coiba. Most people think that Mobulas live just below the surface in warm temperatures. But recent findings revealed that these rays can descend with speeds of 22 km/hour (which is way faster than sharks and whales descend) to depths of nearly 2 km! These deep dives take them 60-90 minutes and brings them to waters of only 4 degrees Celsius. To prepare for their deep and icy dives they play in shallower water where it’s warm to heat up their network of blood vessels in the brain to make sure their brain keeps active during their deep and icy dive. This makes them not only one of the best acrobats but also some of the deepest and fastest divers in the ocean.